How does one prevent cancer? Preventative cancer care is a relatively new but confusing domain within the healthcare industry. People with genetic predisposition for cancer are not classified as patients by medical professionals until they are actually diagnosed with cancer, making their care coordination very difficult. PCH came to Designation to better understand this need and develop a second iteration of their current platform that provides women with the BRCA1 and BRCA2 cancer gene navigational assistance Due to the privacy concerns of the client, all names have been changed and the acronym PCH will be used in place of the original company name. In realm of cancer prevention, resources are sparsely spread out, overwhelming to understand, and the grapple with anxiety over a confusing diagnosis all identified a growing user need. We first set our attention to our user group: highly motivated healthcare consumers diagnosed with BRCA1 and BRCA2. These women are mostly under the age of 55 and began their care journey based on a history of cancer in the family. They are also very proactive in managing their health but struggle with continuous anxiety. PCH V2 is the second iteration of the web app healthcare compass in the realm of preventative cancer care. The product allows users to use the platform as a home base to manage their care, store their research, track their symptoms, as well as feel supported through an online community. We began our research by conducting a hybrid usability test and user interviews. Due to the specfic nature of the problem, we consulted with women from BrightPink and FORCE, organizations that support women with breast and ovarian cancer as well as a genetic counselor. Talking and testing with these women greatly helped hone our understanding of their problems with the current system. 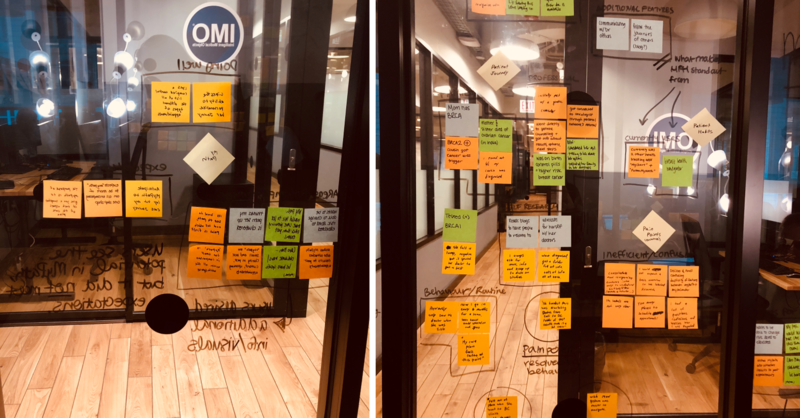 From these tests and interviews, we created a journey map based on the current users’ behaviors. I synthesized the research we compiled into spreadsheets and discovered only a handful of competitors were targeting users with hereditary cancer risk. 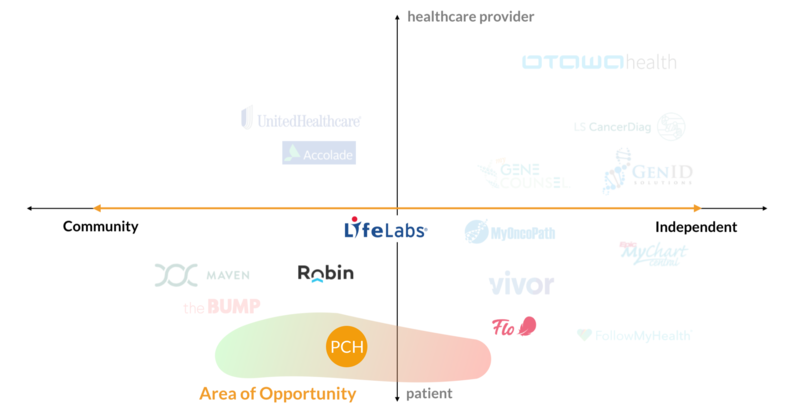 To find more comparable feature sets, we collected data on out of box competitors that had similar concepts applicable to PCH. Before we began concepting, my team and I spend a lot of time grappling with our user research. 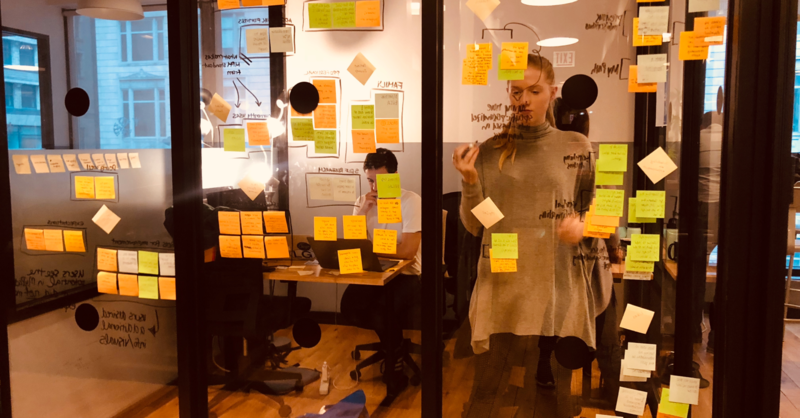 Through affinity mapping, we were able to narrow down key areas of need and opportunity within the current prototype for our users. To keep our team aligned as we started brainstorming, we came up with three design principles that became our foundations in concepting. 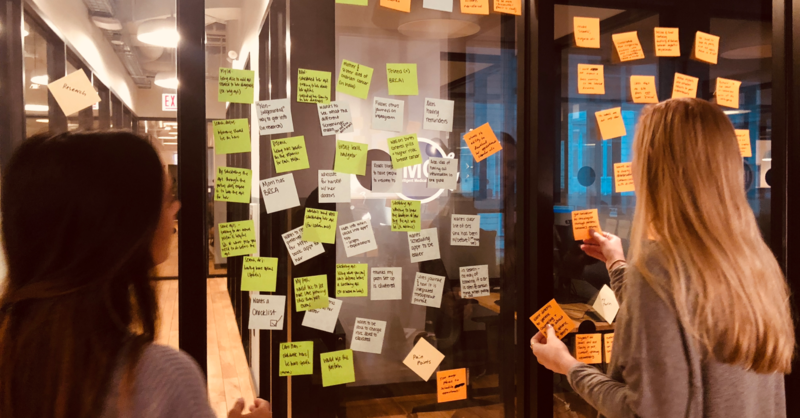 Affinity mapping user insights uncovered specific attributes that would greatly support users through the next few iterations of the current PCH platform. Since the current product was comprised of a collection of features, I created a task flow for our team to focus on a specific user flow. This helped highlight which of the features the product currently had were of more importance and where to invest our time redeveloping concepts. 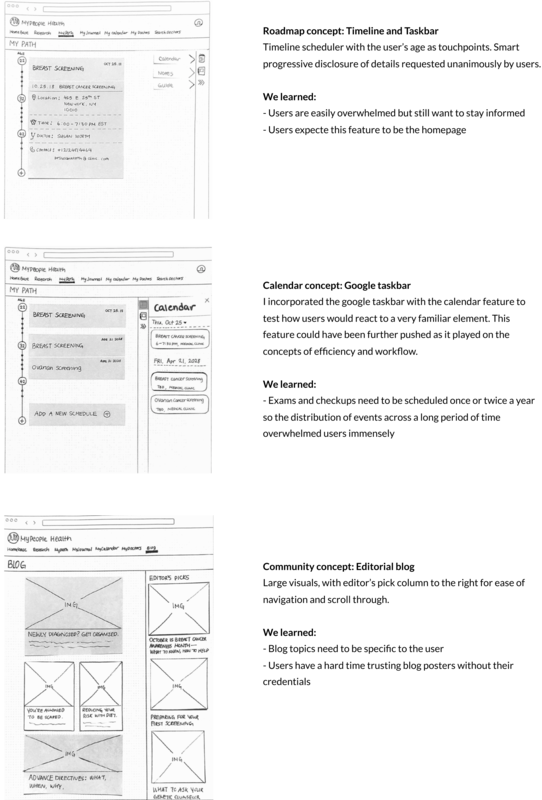 To balance the need of our client and the uncovered needs of our users, we divided and conquered various features that was in or missing from the current prototype that needed redesign. One of the key feature concepts from the current prototype was the Roadmap, which was a step by step guide in organizing care coordination. 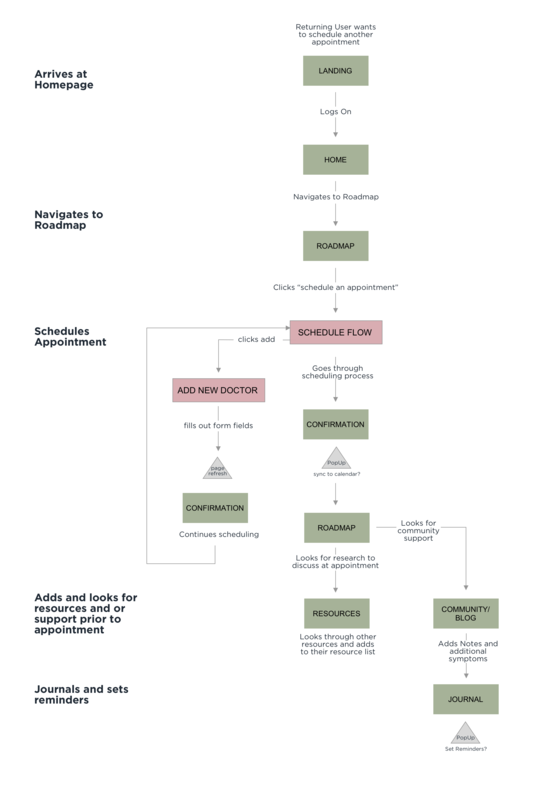 The Roadmap should tell users when to book specific types of appointments and what they entail. My primary focus was on creating divergent concepts for the Roadmap, calendar and community feature. 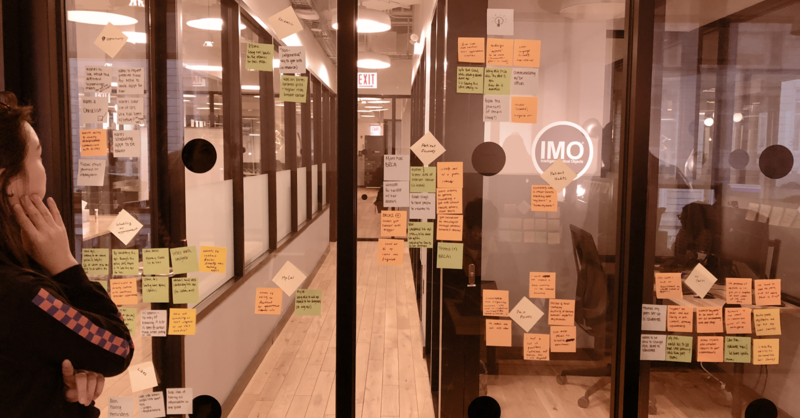 We tested the concepts with users and did another round of affinity mapping to develop better insights. PCH V1 introduced too many new functions that made users hesitant or confused as to how to use the platform. 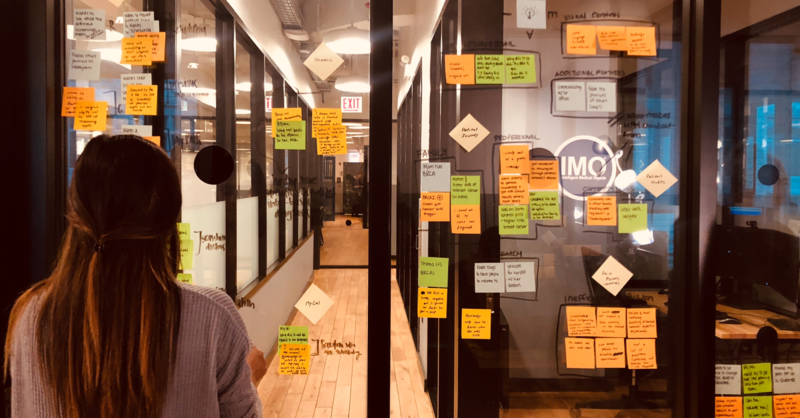 During our concept tests, what worked the best for users wasn’t anything new but something familiar that could seamlessly fit into the working routine of the user’s current habits. Trust builds when there is a distinction between personal and professional. With misinformation everywhere, users are very proactive and skeptical with their research. After introducing community elements, users then asked for clarification of who is giving what kind of information which made absolute sense for users to be able to build trust and continue to come back and use. With each iteration, we began to understand that these women needed the most help with finding right support that would empower them to move forward. As proactive health conscious individuals, they were already reaching out, but through the platform we helped extend that reach. The support they were looking for ranged between emotional and practical practices which the platform is continually morphing to provide. 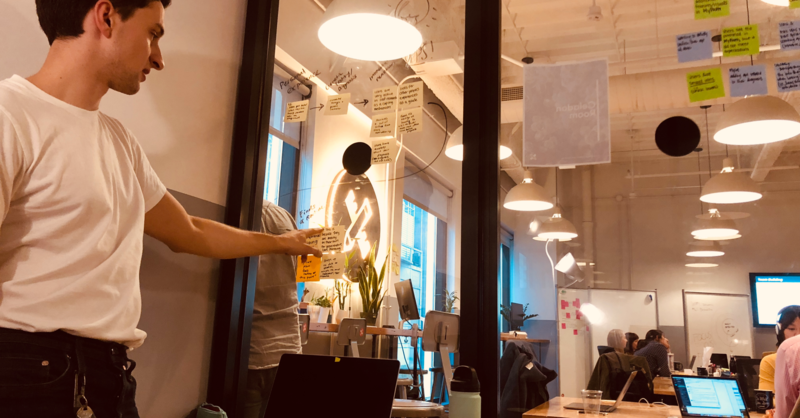 Our client reached out to continue working with our team and although I personally could not commit to too many projects at once, several teammates agreed to further the work.